The magazine aims to keep readers in touch with the school and its alumni by providing coverage of campus events, academic programs, research, student life, alumni news and other issues of concern to the community. According to in-depth readership surveys, the magazine has a loyal and interested readership: the latest survey indicates that 94 percent of recipients read the magazine, with 39 percent of respondents reporting that they read it “cover-to-cover.” Mines Magazine has a press run of 30,000 and has been published continuously since 1910. Publisher prefers high-resolution PDF files (CMYK at least 300 dpi). Completed ad material should be sent to [email protected]. All colors must be reproducible from process color. Any required changes are the advertiser’s responsibility. No changes can be made to ads after the material deadline without special permission from the publisher. Storage and material: Materials are stored for one year by the publisher, and then destroyed unless other instructions are received from the advertiser or agency. Full bleed: Accepted on all ads (add 0.125 inch on all sides to accommodate), and we recommend a 0.25-inch margin. All prices below are for a single advertisement. Discounted rates apply to advertisers placing an order for a year at a time (four issues). To place your ad order, download our display ad order form, and email it to [email protected] or place your order online. To place your ad order, download our At-Your-Service ad order form, and email it to [email protected] or place your order online. Advertisers can place an ad on website for three months or a year at a time, either in addition to the print advertisement or as a single advertisement order. To get the discounted full year rate, advertisers need to select this option up front. New ad artwork can be sent each quarter. Please submit a jpeg or gif optimized for web, RGB, 300 x 250 pixels. To place your online ad order, please email [email protected]. 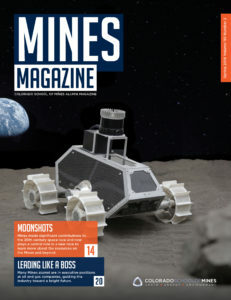 Mines Magazine is published four times a year: winter, spring, summer and fall. Ad orders and ad material must be received by the dates specified below.